Corrections, additions or suggestions for this historical timeline are more than welcome and should be sent to the Webmaster. Although not specifically where the Scout Reserve now exist, parts of Haliburton County were explored by Lieutenant James P. Catty of the Corps of Royal Engineers as part of an expedition seeking a possible canal route between Ottawa and Georgian Bay. He crossed by way of Balsam and Kashagawigamog Lakes and the York and Madawaska Rivers. 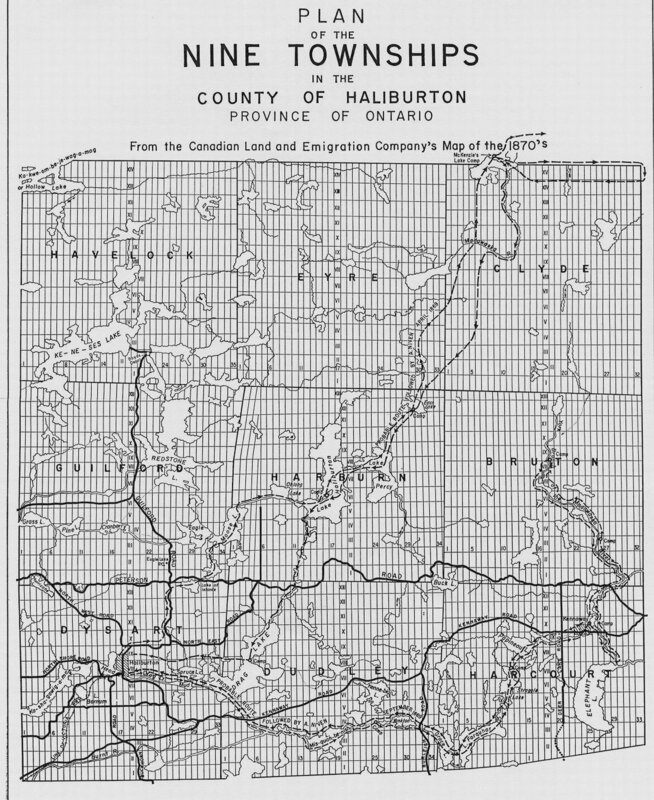 The territory now known as Haliburton was partially surveyed by a Mr. Robert Bell. The Bobcaygeon Colonization Road was designed to open up the districts lying inland from the settled townships. Construction began in 1856 from Bobcaygeon running northward to the interior of Haliburton. In 1858 Richard Hughes was appointed government land agent at Bobcaygeon and directed the progress of settlement. Free grants of land along its route were made to persons fulfilling the required settlement duties. By 1863 the road, sections of which follow the boundaries between Victoria and Peterborough and Muskoka and Haliburton, was completed to the Oxtongue River in Franklin Township. The southern section, between Bobcaygeon and Minden, is still in use. Muskoka Falls was the western terminus of the Peterson Road, a colonization road named after surveyor Joseph S. Peterson. Constructed 1858-1863 at a cost of some $39,000, it stretched about 114 miles between the Muskoka and Opeongo Roads and formed part of a system of government colonization routes built to open up the southern region of the Precambrian Shield. Poor soil disappointed hopes of large-scale agricultural settlement along this road both on government “free-grant” lots and on the lands of the Canadian Land and Emigration Company. By the 1870’s portions of the route were overgrown, though certain sections aided lumbering and now contribute to the development of an important Ontario vacation area. Brookes Wright Gossage, PLS with other surveyors under his direction began work in the townships of Dysart and Longford. At first, Gossage was in partnership with John Stoughton Dennis and later with Vernon B. Wadsworth. As many as sixty or seventy men were employed on the project at one time, and large sums of money were required for wages and provisions. Although the Company had to pay for all the land except swamp. When the survey was completed it showed 403,125 acres in the ten townships of which 41,000 deducted as swamp, leaving 362,125 acres to be paid for at 50 cents per acre. The Canadian Land and Emigration Co. (CLAEC) was formed in England under the laws of Great Britain, to promote the colonization of the territory which was “wrongly assessed” as land suitable for settlement and agricultural purposes. The Honourable Mr. Justice Thomas Chandler Haliburton was the chairman of the company and gave his name to the district. The purchase, holding, alienation, sale, lease and disposal of lands or property of any kind, in the Province of Canada. The survey, improvement, clearance and cultivation of the lands belonging to or under control of the Company. The promotion and encouragement of settlement thereon, by the loan of money to settlers and others, and the establishment of Schools and the erection of places of Worship. The opening, making, improving and maintaining of roads, railways and other communications and the subscription of any Railway Undertaking, with a view to the settlement, cultivation and improvement of such lands. The promotion of emigration into the said province from the United Kingdom of Great Britain and Ireland or elsewhere and generally the performance of such acts, matters and things as are incidental or otherwise conductive to the attainment of the before mentioned objects or any of them and also such additional or extended objects as the Company may from time to time, by special resolution, determine and resolve. 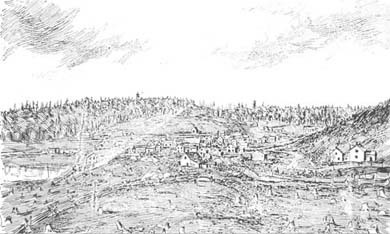 Lengthy negotiations were carried on between the Company, and the Department of Crown Lands concerning the selection of townships and the terms of sale. The Department agreed to pay for the survey of the outlines of the townships, but the Company had to pay for the survey within the townships and their subdivision into lots. Early township map labelled Kennabi Lake as “Ken-ne-big”. The town plot of Haliburton was surveyed by 1864, a sawmill erected there that year, and a grist-mill built in 1865. Charles R. Stewart was appointed the first resident land agent. The Kennaway Road was started between the Town of Haliburton and the Village of Kennaway. It was built by hand labour and primitive equipment and was completed about 1872. It was named after Sir John Kennaway, the High Sheriff of Devonshire and a member of the Board of Directors of the Canadian Land and Emigration Co. (see 1992). He was also the Member of Parliament for Honiton Riding in Devon, first elected in 1885. Grace Lake was named for Kennaway’s wife and Farquhar, Percy and Kingscote Lakes were similarly named after company officials. In 1869, Messrs. Boyd, Smith & Company, lumbermen from Port Hope, obtained the timber rights on the Company’s lands in the townships of Dudley, Gilford, and Havelock. The lumber business caused an economic boom in the region. Mossom Boyd Co. granted the right to cut the white pine in the whole of Dudley Township. Township lumbered except for Concessions 11, 12 & 13. Census of Haliburton shows 6 ratepayers, 13 souls, 9 cattle and 3 hogs. By 1871, The Canadian Land and Emigration Co. had sold 16,650 acres to settlers and a number of town lots to various purchasers. In 1872, the Company built a road between the villages of Kennaway and Haliburton. Also, the Company contributed greatly to the cost of the connection of a telegraph line to Haliburton. In 1877, The Canadian Land and Emigration Co. contributed to the construction of the Victoria Railroad Company line from Kinmount to Haliburton with the hopes of increasing settlement in the Townships. This did not happen. Although the Victoria Railway never extended any further, it became an important regional timber and mineral carrier with a link to other systems at Lindsay. In the mid-1880s it was taken over by the Grand Trunk Railway and later became part of the Canadian National Railway system. The Haliburton Railway station was built in 1878 as the terminus of the Victoria Railway, an 88-km-long line from Lindsay. The building was completely remodelled by the Grand Trunk Railway around 1900 and given its decorative woodwork and trackside bay window. It was acquired from the Canadian National Railways by the Municipality of Dysart et al on its centennial in 1978, and restored and adapted for the Haliburton Highlands Guild of Fine Arts. By 1883, the Province of Ontario had begun to open up neighbouring townships with offers of free land grants. The Company was unable to cope with this competition. As a result, the Company decided to offer for sale its complete holdings and undertakings in Canada. The Company was purchased by W. H. Lockhart Gordon and James Irwin on April 11, 1883. It should be noted that Mr. Irwin had previously been involved in lumbering in the area, beginning in 1877, and had entered into partnership with Mr. Boyd, who was already involved in the timber industry at that time. On April 10, 1889, Letters of Patent were issued by the Province of Ontario incorporating the new Canadian Land and Immigration Company of Haliburton Limited. From 1890 to 1897 little activity took place. Sales of land and timber cutting right had practically ceased. Farming by John Z. Nellis, David H. Pollard and Francis Spiers attempted but later abandoned. In 1895, Mr. Irwin declared bankruptcy and the bank (most likely the Canadian Bank of Commerce) took possession of his rights and interest in Haliburton, which included Irwin’s shares in the new Company. Laking Lumber Company lumbered between HSR and Haliburton Village. Their depot camp was at what we now call “the mill site”. This location had originally been the site of David H. Pollard’s Farm. During World War I, Jim Robertson while apparently evading conscription, lived in a small shack on Twister Point where he trapped and collected ginseng roots which at that time were quite abundant and as now, valuable for export to the far east. A few years later, he was believed to have built a small trappers cabin on Hidden Bay although by the 1990’s no remains could be found. Around the same time, our Trapper’s Cabin (between Little Chip and Ojibway Rock) was built by Ken White with the help of his friend, trapper Len Holmes. Len is credited with first stocking our Kennabi Lake with small-mouth bass which were carried overland in a kettle fitted in a back pack, probably from Grace Lake, which he had previously stocked in the same way from Paudash Lake. During the 1920’s the Company sold the entire township of Bruton to the Ontario Hydro-Electric Commission and proceeds from the sale allowed the Company to buy back from the bank the timber cutting rights previously licensed to Irwin. During the depression, lumbering activities ceased once again, but as more roads were constructed, the region began to develop as a tourist and vacation area, and land sales began to increase. At the outbreak of World War II, lumbering activities intensified, and carried on into the post-war years. Mill Valley Lumber Company starts lumbering in area. Their office and mill site were also at the old Pollard Farm site which remains the only significant cleared site on the Reserve. Fire on the shore of Burnt Bay (on the north shore of Kennabi Lake part way along the “admin channel”) burns for 3 1/2 weeks as the result of carelessness of fisherman who failed to properly extinguish their campfire. By the end of 1946, all of the land originally purchased by the Company had been sold. The Canadian Land and Immigration wound up its affairs, surrendered its charter, and ceased to exist. J.C. Moore (47-70) located the property on Thanksgiving Day and a $25 down payment was made to the North Shore Realty Co. The final price paid for 4,150 acres was $3.75 per acre. On November 5th, Fred Hurst, Camping Chairman and Fred Buesnel (59-62), Field Commissioner visited the site. Mr. John Harris, President of North Shore Realty, and Mill Valley Lumber Co. donated 150 acres on Drag Lake to give us access to East Bay. The north shore of Kennabi Lake, south of the Kennaway Road was still owned by Mr. Ernie Fee of Lindsay who donated the land in return for $3,000, which was the cost of the road and cabin (south part of Kennabi Lodge) which he had built. It is not possible immediately, to set down a long-term policy for operation of the camp as much investigation must be made and material and data examined that we be sure we are on the right track on a plan for development and use of the new site over a long period. It was decided that in keeping with our agreement with Mill Valley Lumber Co., experimental camping on a troop basis will be permitted. On account of the nature of the country and limited facilities at present available camping will privileges will be granted only to groups of qualified campers with adequate leadership of special qualifications. Application will be filled out on the regular camp permit form and mailed to Headquarters for approval in the usual manner. Mr. Hurst stated that he had discussed the question of general camp supervision with Mr. Greenaway and felt that a staff man should be appointed. Mr. Hurst suggested that Jimmy Moore be appointed Camp Director and that he be authorized to supervise development work on the camp and have supervision of all groups using the camp. (Carried) Supervision will be required during July and August and living quarters will be provided for Mr. and Mrs. Moore in the cabin bought from Mr. Fee if Mr. Moore feels that it would be suitable. Mr.. Moore stated that he had looked over the building and although some essential equipment will be required, it will serve the purpose this year as we will all be pioneering at the camp this year. 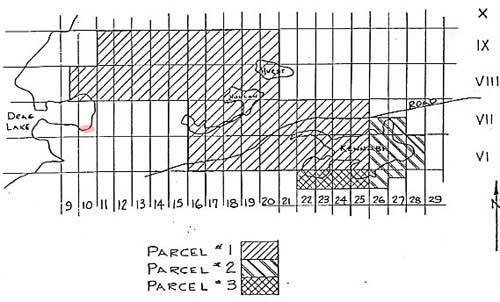 The problem of marking out boundaries of the property was discussed and various suggestions made as follows: fencing the 10 or 12 miles was out of the question; white rings might be painted around the trees in a line surrounding the property; a single wire strand; a path or road well marked with signs might be constructed over a period of time. Until such time as a satisfactory method is found, careful supervision must be given to groups. The secretary suggested that each group coming into camp should be advised of temporary boundary limitations, precautions to be taken against becoming lost and procedure incase they should become separated or astray. Groups using the camp this year should be confined to the area bounded by the lumber camp, Minnie and Hollen Lake, Kennabig Lake, Lost Lake and the small lake south of the lumber camp. Keith McKim said that he believed that generator type telephones would soon be available at a reasonable cost and could be operated on a single wire system and well marked and numbered stations set up at strategic points on the property. Anyone not sure of his location could ring in and report the station number or follow the wire back to camp. A new camp road is built from the mill site to the camp. Staff consisted of five members during this first year of operation. Two army trucks bought from War Assets at $325 each in the fall. They had been used as battery trucks at an airport during the war. First two Queen boats obtained from the Navy League. First “Lake Troops” to camp at HSR were the 22nd, 81st and 101st Toronto Troops. First campsites were Twister and Big Bear. Mill Valley Lumber Co. lumbering rights expire. Cabins moved from Mill Valley Lumber Co. (located at the Mill Site) included Kennaway Cabin (which had been a bunk house),and Cooky Cabin (which had been a meat storage hut). Hurst and Guest Cabins were all built out of lumber from one of the mill bunk houses. The Ranger’s (JC’s) Cabin (which was originally a granary) was built. The first part of the cabin, the sitting room, was built by Al and Don Moore for their use from wood from the mill site. First Maintenance Workshop was built to be used as storage and as an ice-house. Central wing added to Kennabi Lodge as a bedroom for J.C. and Mrs. Moore. The exterior of Pow-wow Lodge was built. It was first designed as a hospital but it was felt that it was too big and so became a staff dorm. North wing and fireplace added to Kennabi Lodge, again as a bedroom for the Moores. With funding from the Rotary Club of Toronto, a kitchen with a veranda (on which the first composite troop ate it’s meals, was built by Mr. Gordon Keeber. This would form the first part of the Rotary Hub. Lakeview and Driftwood Cabins built. A hospital (later called Bayview Lodge) was built with funds donated by the Scottish Rite Masons of Toronto and the late J.P. Bickell Foundation. Hospital equipment was donated by the J. F. Hartz Co. Guest and Hurst Cabins were built with lumber from one of Mill Valley bunkhouses. Camp staff included Muriel Moore ($50), Don Moore, Allan Moore (47-54) and Ross Mitchell (48-54) ($25 each). Junior Board of Trade (know as “J.C.’s”) donated first staff boat “JC I”. In November 1949 permission was given for a cabin to be built on the northwest shore of Hurst Lake by the 194th Toronto Rover Crew. It was used by Toronto Rovers throughout the fifties. 40th Toronto Troop under Scoutmaster Syd Young, started to build the totem pole which was known as “Sydney Joe”. It was finished in 1951 and stood by the north wall of Kennabi Lodge. It was relocated by the gate from the parking area to the main dock area until it disintegrated in 1995. Building of the first Boat House (20′ x 40′) was started by Bill Wilson of Dorset, mainly for storage of boats. A system of log slips was built at the main HQ dock to provide a safe and orderly accommodation for staff boats. Ladies Auxiliaries donated a Peterborough boat and “fast” 10 HP Johnston motor. Mill Valley Manor moved down to the Camp HQ (west end) and rehabilitated into a three room staff cabin. It had been the office and residence of the mill manager. Bunky Cabin was built for the Administrator/Program Director. It was first located in the swamp where the Snack Shack is today. Another room was added to JC Moore’s Cabin. Staff feeding centralized in Kennabi Lodge and a cook, Mrs. T. Wells was hired for the first time. Camp telephone system installed between Camp HQ and several sites on the north shore with the assistance of Mr. Robert H. Saunders, Chairman of H.E.P.C. (and former Mayor of Toronto) and Mr. Keith McKim, Assistant Area Commissioner (Rovers) – North Toronto. Three Queen boats were reconditioned, repainted and equipped with safety tanks. Regatta Day is the only regular, combined troop activity organized by the staff. It was held on Thursdays at 1:00 pm at Big Bear Point. Program lessons offered by the camp staff included canoeing, boating, swimming and water safety. For the fourth year, Camp Kennabi gained first prize in the Haliburton Rotary Club Carnival Parade where 152 Scouts took part including the 101st Toronto, 2nd Barrington, a troop from Rhode Island and the 25th Hamilton Sea Scouts. A gasoline operated water pump system and triple sinks were installed in the Rotary Hub and a large veranda was built across the complete face of the building. A large look-out tower, about 50 ft high was built adjacent to the Rotary Hub with three observation platforms and ladders and is equipped with a large 400 lb bell donated by the 101st Toronto Troop, in memory of a Scout who died as a result of an epileptic seizure while canoeing. The first guest sites on the north shore of Kennabi Lake within easy distance of camp HQ, were cleared and equipped with four tent platforms. Camp Kennabi Staff included George Jones and George Kerr as Deputy Camp Chiefs, Ross Mitchell, Don and Allan Moore, Ken Jorgensen (stores and equipment), Peter Trant (program), and Bruce Currie (spare truck driver and general handyman), Bob Jones (Tuck Boat) and Rene Marmoreo (handyman). East Bay Point campsite was opened by the 197th Toronto Troop. Ojibway Rock was opened by the 133rd Toronto Troop under Harry Bruce. Loon Island was opened for camping by Syd and Dory Young of the 40th Toronto. Indian Point, named because of the remains of an old Indian birch bark canoe which Scouts of the 40th Toronto troop found when they first camped there. Little Lithuania, an island in Mud Bay, is the favourite new site of members of the 226th Toronto Lithuanian Crew. Several other small Patrol sites were opened up on Doe Island and other spots on the lake. 58 long-term camps (1,853 campers for 10,420 camper days) Of these 9 were out-of-town groups. Pow Wow Lodge (used for emergency accommodation or wet weather activity) was improved with the completion of a massive stone fireplace and the installation of a stove and additional windows. Guest and Hurst cabins were built. Nature Museum cabin (later Northern Lights) built. Roads were opened up and improved to give access to camps along the north shore of Kennabi Lake; to Lost Lake and Big Bear Point; to the Drag River; and to Hollen Lake. This last road was extended to within a short distance of Hurst Lake and gave access to our own gravel pit. A trail was blazed from the north-east corner of Hollen Lake to the top of Beaver Lake and through to North Lake. Fifteen troop campsites have been developed on Kennabi Lake. At least two skiffs (more when available) were allocated to each troop. Additional boats were allocated as required. Canoes were loaned one day per week for program instruction. Bathing and swimming periods are conducted on a unit basis in buoyed swim areas at each campsite. The 152nd Troop under Dr. Jim Anderson, opened up a new canoe route via Yankton and Grace Lakes to Farquhar Lake. A Silver Arrow Course was held at Big Bear Point. As part of their activity they started clearing a training site on Lost Lake. Junior Board of Trade (J.C’s) donated second staff boat “Jaycee II”. Staff included J.C. Moore, George Jones, George Kerr, Larry Whitehorn, Landon Spencer, Ross Mitchell, Don and Al Moore, Jim McMurray, Bob Jones and Mrs. Hardman. George Kerr, Field Commissioner, served as Camp Director of Camp Kennabi due to J.C. Moore being ill. If we work upon brass, time will efface it. 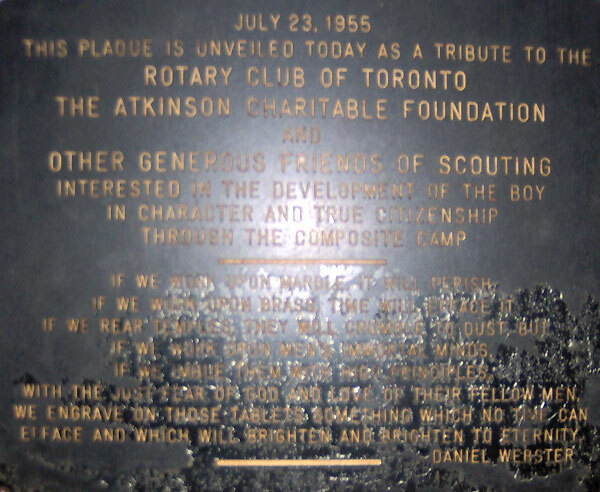 The dining hall area of the Hub was built with financial support from the Atkinson Foundation under the supervision of Cec Elliott, Rover Scout Leader of the 86th Toronto. (?) Chef’s Chalet built just north-east of the Hub Kitchen as accommodation for cook. Composite program re-started with 30 campers on Doe Island also with funding from the Atkinson Foundation. H-Hut built east of Chef’s Chalet. A ground fire was discovered on the top of Pikes Peak on August 15th and was not officially declared out until September 1st. Lands and Forest workers were sent in to assist and estimated that 4 4/5ths acres were burned. Camp Kennaway (composite program) averaged just under 100 per week and ran Wednesday to Wednesday periods. Bob Hunt was Camp Kennaway Director. A one-ton jeep had been purchased the previous winter. Camp committee discussed providing facilities for Cub Camping at Haliburton. Radioactive showings were found at camp and Hallet Explorations indicated an interest in further explorations and diamond drilling. The Ministry of Lands and Forests were doing a timber cruise which indicated millions of feet of commercial timber which should be cut or be lost. An estimated 1,000,000 board feet of pine was noted in an accessible area near Hurst Lake. The east shore of Kennabi Lake was still leased from Wilberforce lumber for $1.00 per year. Trading Post was started. Prior to this a “tuck” boat went around to each site until too many Scouters complained about the easy access to junk food. Staff Cabin (now the Ranger/Director’s Cabin) was built by staff members using dead heads from Kennabi Lake, under the direction of Mr. Gordon Keeber who was then the District Commissioner of Willowvale District, Toronto Northwest Area. Hurst Lake dedicated in the memory of Frederick C. Hurst, Chairman of the Camping Committee during the purchase and development of HSR. Camp Kennabi had 67 troops with 1194 campers for 10911 camper days; Camp Kennaway (composite) had 568 campers for 8,351 camper days. Camp Kennabi again won 1st prize for the best boys and girls camp, and Silver cup for the best float, at the Rotary Carnival parade. This was a record year with ninety registered long-term camps and many short-term and weekend camps, totalling 2,779 campers for 16,630 camper days (excluding the composite program.) 26 troops attended during the first week in August. 80% of troops were from the newly formed Greater Toronto Region and 20% from outside GTR. Bob Dodds was Deputy Camp Chief to J.C. Moore. The main camp road and the roads to Lost and Hurst Lakes were considerably improved and in near the end of the summer, a near trail was bulldozed from Hollen to Scraggle (later Moore) Lake to open new camping areas for use. The 3rd Etobicoke Troop held a successful pioneering camp on Lost Lake opening up patrol sites and constructing rustic shelters. A successful Silver Arrowhead (leadership) Course was held at Hurst Lake. Two Rover Moots were held at camp: A GTR Moot held at the mill site on the Civic holiday weekend with over 100 Rovers in attendance; and a Provincial Moot on the composite troop site on Labour day weekend with 386 Rovers present. Due to the end of funding from the Atkinson Foundation Grant, the Camp Kennaway (composite) fees increased from $14 to $22 per week. Despite this 328 campers attended (two weeks each) for 4,592 camper days. Don McLean was Camp Kennaway Director. Camp Kennabi and Camp Kennaway combined to form the Haliburton Scout Reserve. Lakeview Cabin enlarged to house the Camp Director and his family. Skippers meeting were now held on Sunday evenings. Third barge purchased and two additional lifeboats acquired from the Steel Company of Canada. The Tuck Shop was renamed the Trading Post and was open Mondays, Wednesdays and Fridays from 7:00 pm to 8:30 pm. Approx. 200 persons were treated by the camp nurse and doctor. Picnic tables used for the first time (as an experiment on the composite troop site). A new paddle shack was built at the end of the season. The marshy area (where the Snack Shack was located until 2005) was cleaned up and filled and it was hoped that this space could be equipped with picnic tables for visitors. First stairs were built from the bottom of the Hub Hill to the top. Underwater cable was first used to connect telephones at the Camp HQ (Kennabi Lodge) to the programme centre. 116 (excluding composite) Troops camped at HSR: 92 from GTR and 24 others. 438 Swimmer’s badges were past at camp. C.R. (Rollie) MacNeill (62-63) is Camp Director. Concession 5, N 1/2, lots 22 to 25. The bell tower at the Hub (with the original bell donated by the 101st Toronto Troop which received it from the old Swansea Fire Hall tower) was pulled over by Ernie Tidy and Harry Hutchings and the bell was cracked. The current bell was later secured from a local school house in Haliburton. Sonaqua Composite troop located on the south shore of Hurst Lake. The Snack Shack built was built between the parking lot and the main arrivals/departures dock to provide refreshments, light meals and souvenirs to campers and their families on Saturdays. Sonoqua composite troop located on the south shore of Hurst Lake and Manitou composite troop located on the north shore of Hurst Lake (who used the Rover Cabin for the leaders). The weekly regatta was “revived” for Lake Troops. Staff-in-Training program started with twelve SIT’s who lived in tents. The 1964 Administrator recommended that the staff be housed in cabins and that they be paid at least a small amount! Started to buy aluminum boats. The Rover Cabin built in the early 1950’s at Hurst Lake has become unsafe and is knocked down. Last year which the Nature Museum operated (in what is now Northern Lights Cabin). This activity was started by Dr. Jim Anderson (54-57?) in the late 1950’s. Composite sites of Sonaqua and Manitou (both at Hurst Lake) were moved to Smokey Hollow and Rover’s Rest respectively. On December 14th parcel #4, a small part (approx. 1 acre) of lot 10, Concession 7, on Drag Lake (see pink dot on map below for general area) is purchased from Thomas Irwin Limited of Burlington for $4,000 for storing canoes and providing access to Drag Lake. The “HSR Bear” starts showing up on the yearly crest. The first camp telephone switchboard (a restored Type 551) was installed in the Admin office in Kennabi Lodge by Murray Crimless (68-73,81-95). Twenty new acquired and restored mini-crank telephones were also installed and would serve for the next twenty years. Country Store started in the Rotary Hub by Bruce Quinn (63-70,80). Trail from Mislaid to East Bay (Drag Lake) built. “Indian” program run for one year at the Trapper’s Cabin by Al McClelland. (?) Tent City built on the location of a former composite site east of Hub and south of Lookout Lodge. Could someone confirm this? Staff shirts changed from yellow to blue. Jack Dobson (72-88) becomes new Camp Ranger. Trapper’s Cabin (which had been built and used by a trapper White and purchased for $75 which included traps, skin boards and a gun) was restored under the leadership of Dave Reeve (68-72) and assisted by Ian Jones (63-67,71-73,99-01), David Smith (69-74), John Beaton (69-70,72), Terry Trussler (65-72), Gord Sisler (70-73), and John Cruickshank (69-72). (See Restoring the Trapper’s Cabin.). Moore Lake (formerly Scraggle Lake) named and dedicated on August 12th in the memory of J.C. Moore with a cairn and plaque. Jim Butler (69-73) is Camp Director. Roy Hockings (72-79) becomes Camp Director (through 1979). “Newer” Type 555 telephone switchboard was installed replacing the earlier Type 551. Nothing exciting seems to have happened this summer…. Jubilee Campsite opened west of Birch Point and named for Queen Elizabeth’s Silver Jubilee. Autumn – Hemlock Cabin built on site of first rifle range above Hub. Rifle and Archery Ranges relocated north of East Bay campsite which was by this time, no longer being used for camping. November – Colin Sears becomes new Camp Ranger. Nature Arts program offered by John Kissick (77-80). Bill Henderson serves for one year as Camp Director. (?) Bunky and Hilltop cabins moved to “Beaver Flats” beside Northern Lights and Pioneer cabins. Would appreciate if someone could confirm this date. Ron Rochester (76-77,81-84,89-91) becomes Camp Director (through 1984). House Trailer purchased and sited near Hemlock Cabin on the site of the first rifle range. H-Hut (east of Chef’s Chalet) torn down and replaced with three two-person cabins jointly called C-Huts and numbered 1, 2 and 3. Ontario Hydro finally arrives at HSR, brought in along the Kennaway Road from the Burleigh Road. First Annual Staff Cricket Match held at the old mill site followed by High Tea. Survival Program started with Rob Fleming (82-84,86) as the first instructor at the Beaver Composite site. Bob Painter (77-79,85) is Camp Director for one year. New Health Centre built behind former Beaver campsite (between Twister Point and the Hub) replacing the camp hospital which had been located at the west end beside Kennabi Lodge. The former camp hospital is converted into a residence and renamed Bayview Lodge. (?) Tent City closed and new cabins for IT’s built on former site of archery range. Colin Sears ( -94) becomes Camp Director, serving until 1994. Survival Program moves to Pine Island. Camp wide campfire area built at former site of “tent SITy” and composite campsite and named “Smokey Hollow”. Jaycee Cabin built on “Cooper’s Hill” by the Toronto Junior Board of Trade who provided both the manpower and the funds. Road built through our property near Drag Lake to provide access to cottages beyond the end of the East Bay Road. This gave vehicular access to our campsite on Drag Lake. New outboard motor shop built at Maintenance area. January 17th – HSR Staff Alumni started. Small new aluminum barge was purchased. After only being used only once in 1988, Eagles Nest site was closed. Twister site was closed to allow for re-growth. It was reopened in the mid-90’s. The Dobson Trail (from parking lot to Hurst Lake Road Gates), started in 1988, was opened and dedicated in memory of former Camp Ranger Jack Dobson (72-88). In February 1990, Scouts Canada signed an agreement providing for first right of refusal to in return for $1,000 from neighbours William and Constance Gail Cornwall, for the cottage lot (Concession 7, part of Lot 10) on Drag Lake. A new Country Store and Administration office (The Dobson Centre) was built on the former “Beaver” campsite and dedicated in the memory of former a HSR ranger, the late Jack Dobson (72-88). Much of the funding was provided by Jack’s estate. The camp Health Centre interior is upgraded by the HSR Staff Alumni and dedicated in memory of a former staff member, the late Dr. Tom Munro (58-61). Four new aluminium barges are purchased to replace the old steel barges. Two of the steel barges are cut up for scrap metal, one is dragged up the Hurst Lake Road to be used as a bridge bed across the “River Cry” and one is set up north of the QM shed as a reminder. Pikes Peak Trail opened from Dobson Trail to the main road west of the Mill site. The KT&T sees a full dial NU92 PAX switchboard installed in the new office and all telephones are assigned a two digit telephone number. The job of switchboard operator becomes redundant! Two new troop sites on which work was started the previous year are opened for camping – Anii Shores (meaning “welcome” in Ojibway) on the north shore of Buck Island east of Pal Point, and Cedar Steppes, opposite Pittin Point on the south shore at the entrance to Hidden bay. An 1876 dime was found in main parking lot on the site of the Old Kennaway Road by Murray Crimless (68-73,81-95) while demonstrating his new metal detector. Cooper’s Loop Trail from Hurst to North Lake reopened. Cooper’s Loop Trail from North to Mislaid Lake reopened. Waconda campsite (re) opened on Indian point and used by the Composite Troop. Basic and full flat water “Charge Certificate” courses are offered to Scouters at camp. Ted Aylan-Parker and Bob Spencer become Camp Co-Directors. Supported by the HSR Staff Alumni and friends of Frank Standing (66-67,69-72,74-88), the Kennabi Lodge restoration was completed (north and central wing) under the supervision of Ab Morrow (75-87,92-99) and dedicated on August 7th to Frank’s memory. It is to be used as the Saturday check-in area and to house a camp historical display. In the fall, a new hemlock bridge is built over the “River Cry” (just below Hurst Lake) by the HSR Staff Alumni at the fall Trails Weekend. Ted Aylan-Parker is Camp Director. New QM Shed built on the site of the original and named the “Ab Shack” in honour of long time staff member Ab Morrow (75-87,92-99). Archival Display set up in Kennabi Lodge. Barges are named – Wind Runner, Wave Runner, Star Runner, Lake Runner, Storm Runner and Fire Runner (maintenance barge). Celebrated the 50th Anniversary of Haliburton Scout Reserve. Driftwood Cabin (built in 1949) torn down. New electronic Meridian Option 11 switchboard system donated and installed by Bell Canada. Mud Bay once again opened to canoes, rowboats and kayaks. The remaining Queen boats are retired. Barge dock at Hub rebuilt on cribs. New Lakewood Cabin built between the former locations of Lakeview and Driftwood Cabins. It is fully insulated and has electric heating. A sixth IT cabin built to the north of the original five. New crib docks built to replace the east end barge dock, the admin/store dock and the Gohe site dock. A seventh cabin built just west of the IT cabins for the use of the Staff Assistant. Halfway House built between C-Huts and Lookout Lodge as a new cabin for the camp cook. Insulated and with electric heating, it also has a toilet and bath/shower. Two female IT’s on staff for the first time. A second lane is opened at the Rappell site. New crib docks built at Rovers Rest, Beacrobra, Canoe Point, Doe Island and Twister Point. Ab Morrow (75-87,92-99) retires as Camp Ranger. Keith Whiten (00-03) of Haliburton starts as new Camp Ranger. New crib docks built at Big Bear, Birch Point, Sejur Heights, Ojibway Rock, Pitten Point and Westview. Long Drop closed down and superstructure used to build new Paddle Palace on the waterfront. Northern Lights and Lookout Lodge lifted, levelled and set on new piers. Northern Lights also gutted and renovated including insulation in the walls and ceiling. Some interior renovations down to Lookout Lodge. Chef’s Chalet gutted and turned into two rooms each with own entrance. New roof on Health Centre and new floor in nurse’s quarters which also have the walls insulated. Half walls put on two sides of Hurst Lake Pavilion. Cabin mouse proofing campaign started. JC Moore’s cabin (overlooking the maintenance channel) renovations started by 1st Kennabi Rovers and Ranger Keith Whiten (00-03). Ted Aylan-Parker (61,63-66,71,80-85,90-01,03-04) returns as Camp Ranger and completes 25 complete summers on staff. Previously J.C. Moore held the record at 24 summers. A very interesting history. I attended the composite camp from 1956-1959. I then worked at the camp from 1960-1963. For the first summers I worked for Fred Busnel ( a wonderful man) and his wife Ruby at the Hub and then was on maintenance. In 1963 I started in maintenance, then became the truck driver and then was put in charge of the Hub quartermaster. I note that Ted Aylan-Parker spent many summers as the man in charge. Ted’s family moved from Montreal to Toronto in about 1959 and a house across the street from ours and thus his introduction to HSR. Of note- I lost track of Ed (Monty) Macpherson who was my introduction to HSR,-( and who worked there in 1959-62) however, approximately 10 yrs ago I tracked him down and found out that he is a very busy canoeist and we have done a number of canoe trips in the Temagami area. The comment about the bell tower and Ernie Tidy brought back memories as I was there when the tower went over with Ernie on the top- it was amazing he wasn’t seriously injured. Another memorable moment was when Bill Henderson had his new outboard and was showing off and came into the U dock at high speed and put the engine in reverse only to have the motor flip up as it wasn’t locked in the down position and the brand new boat hit the dock at considerable speed and while the result could have been much worse- the only real damage was to Bill’s prowess as a boat driver. – we were dragging behind the ford pickup an old very large flywheel used in the previous lumber operation and while I was initially at the back of the truck for some reason I moved up to stand behind the cab and not 2 minutes later did the 10′ long shaft swing around and come crashing down on the tail part of the pickup where I had been sitting! -Even more dumb was when a bunch of us (with some young ladies from one of the lodges) on one of our many nights out were at a beach on Lake Kashogawigama (sp) and decided to go swimming as it was a warm night and the band was playing at a lodge across the lake. it was totally dark when all of a sudden a boat with no lights came into the group at full speed. One girl was hit by the boat and had a concussion and did recover. To make it worse one of the swimmers was the head of the “waterfront” at the Kennaway! We should have know better! I also remember the old propane generator. My late father was close to retirement at Hydro and investigated the possibility of running a power line to the camp- and the estimated cost in 1963 was some $10,000! My summers at Haliburton were wonderful and I am still involved with the out doors – with an island complex in Georgian Bay, and have in my senior yrs become involved in politics as a municipal Councillor in Muskoka.